“socially responsible” The 2007-2008 recession has impacted everyone, at ReachOption we aim to improve conditions for all people whose lives we touch. We recognize that we will not change the economy with one product but we want to do our share and feel proud of our social impact. This is a win-win solution for all. Recession Lessons: As we learned from the great recession home values do not always appreciate. ReachOption is your partner and shares some of the downside risk of declining real estate values.Unlike traditional financing, ReachOption does not charge interest and does not receive any profits if the value of your home declines. After having to write down millions in real estate lending, banks reduced their LTV’s from 80-90% to 60-70%. Impact: Consequently, credit dried up and financing a home became significantly more difficult. First time home buyers and expanding families are no longer able to reach their dream of homeownership. Home owners wishing to refinance to take advantage of lower rates or to reduce the risk of rate fluctuations are not able to obtain financing. Solution: ReachOption fills the gap by providing funds for the remaining 20%- 40% portion of the value of the property that banks are not willing to provide. This will aid families buying their first homes and or help others retain their homes without exposing them to additional interest payments. 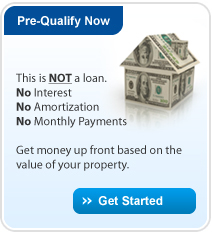 With ReachOption, there is no interest, no negative amortization, no monthly payments. The recession reduced the incomes of many professionals. Impact: People are looking to reduce their monthly outlay to match their incomes. Solution: ReachOption provides funds, with no interest, in exchange for a portion of the appreciation in the future value of the property. The funds can be used to pay down existing HELOC’s or first mortgages thereby reducing the monthly payments while enabling people to remain in their homes. In essence, the homeowner sells an option to ReachOption and receives cash up front and reduces monthly housing outlay. Problem: Homeowners have equity built up in their homes over the last decade but they cannot turn this to cash to cover expenses without incurring additional interest costs. Impact: These people are taking out more debt with home equity financing and extending themselves even though they have learned not to over leverage. Solution: ReachOption provides funds, with no interest, in exchange for a portion of the appreciation in the future value of the property. The funds can be used to pay down any expenses including education, much needed home repairs, medical expenses, charitable activities, etc.. The homeowner sells an option to ReachOption and converts the equity into cash. ReachOption is not a loan.